As the players in the new 21st century race for the Moon line up – the USA rejoining China, India and Russia and jostling with private corporations interested in exploiting the Moon’s resources – a group of artists are declaring a Republic of the Moon: a ‘micronation’ for alternative visions of lunar life. Republic of the Moon challenges utilitarian plans of lunar mines and military bases with artists’ imaginings and interventions. Combining beguiling fantasies, personal encounters, and playful appropriations of space habitats and scientific technologies, Republic of the Moon reclaims the Moon for artists, idealists, and dreamers. The last race to the Moon was driven by the political impulses of the Cold War, but shaped by extraordinary visions of space created by writers, film-makers, and artists, from Jules Verne, Lucien Rudaux, and Vasily Levshin, to HG Wells, Stanislav Lem and Stanley Kubrick. Can artists’ quixotic visions reconcile our romantic notions of the Moon with its colonised future, and help us to reimagine our relationship with our natural satellite in the new space age? Republic of the Moon includes work by artists including Agnes Meyer-Brandis, WE COLONISED THE MOON and Liliane Lijn (about whom see my previous blogs here, here and here). Liliane’s work for the exhibition is called ‘moonmeme’ and it explores the possibility of projecting a word on to the lunar surface that might be read from the Earth. It is an evocative idea — ‘celestial signage, interplanetary publication’ — that I put at the centre of my story. 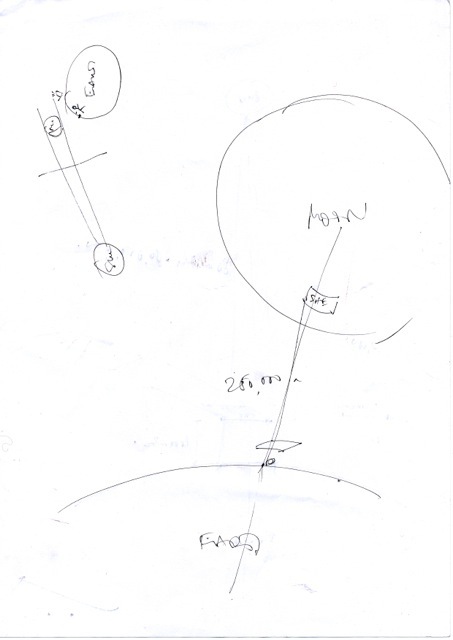 While I was writing the piece I needed to check a few technical matters with Liliane, and she sent me over a couple of beautiful napkin sketches (as in, they were drawn over lunch) thinking around this projection idea. I’ve reproduced one here with permission. Talking of moon-related memes, though, it is interesting to see that an ‘Occupy the Moon’ meme — unconnected with my story — has been proliferating in the form of rightish-leaning and barely satirical spoilers of other Occupy-generated or related web-based material. In that context it is a reductive one-liner and a fairly toothless joke: a Facebook group with no friends, a kind of lame, ‘we’re-the-99.99999%-who-haven’t-been-to-space’ schtick. The work in the Republic of the Moon show is the opposite: subversive, generative and illuminating. I’m particularly looking forward to seeing Agnes Meyer-Brandis’ ‘The Moon Goose Analogue: Lunar Migration Bird Facility’. Meyer-Brandis’ work has a charm and wit that belies its thoroughness and rigour. ‘The Moon Goose Analogue…’ is inspired by a late 16th, early 17th century work of science fiction entitled The Man in the Moone, that was written by the English Bishop Francis Godwin and published posthumously. A new edition of Godwin’s extraordinary text was recently put together by William Poole, and published by Broadview Editions. In Godwin’s story, which includes the first descriptions of weightlessness in space, a traveller named Domingo Gonsales harnesses a flock of migratory geese to make the journey. An idea which reappears of course in Antoine de Saint-Exupéry’s The Little Prince. The Arts Catalyst have recently posted an excellent short video interview with Agnes Meyer-Brandis about her project and the flock of Moon Geese that she, just like the fictional Domingo Gonsales, has raised from the egg for the purpose. The Moon Goose Analogue, Agnes Meyer-Brandis in conversation from The Arts Catalyst on Vimeo. Read my story ‘Occupy the Moon’ on The Arts Catalyst website now.